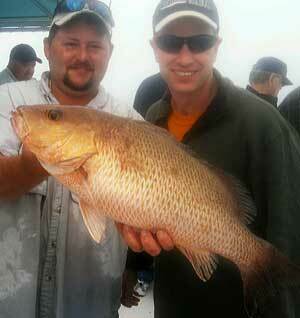 February Mangrove Snapper fishing in Naples continues to be red hot. Sport-fishing charters going offshore are consistently returning with limits of mangrove snapper and Amberjacks. Yesterday our fishing charter went 22 miles into the Gulf of Mexico and fished an underwater reef using squid and Crippled Herring jigs to really hammer the fish. The trip was in flat calm seas and very heavy fog. Apparently the lighting was so bad the snapper thought it was still night time and the big fish really turned on as evidenced by this 8 1/2 bruiser snapper. Don’t miss out on this great deep sea fishing during your time here in Naples and Marco Island.